"The Mystery of the Big Trees" is the 43rd Mandrake Sunday story. The story was written by Lee Falk and drawn by Phil Davis. As the Argos stops at a West Africa port to take on fuel and supplies, Mandrake and Narda takes of in the small amphib to explore the near-by country. They see a small valley with an amazing forest, with the bigest trees they have ever seen. Back at the dock, they decide to make a safari to the giant forest, but when they question natives about it, the natives flee in terror: "Big trees ! Taboo !. 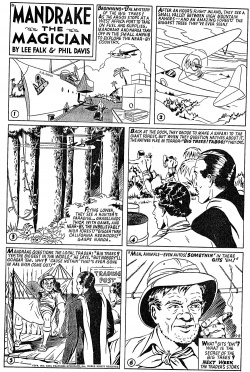 The title for this story is taken from the strip of May 8, 1949 (Beginning: The Mystery of the Big Trees !). This page was last edited on 25 June 2017, at 16:31.